Almost two months ago, Jay did a post riffing on five words that describe her, and offered to provide five words to any readers who would like to try the same exercise. Here, at long last, is my post--and the same deal applies, any of my readers who want words need only ask. Just as a teaser, Umami Girl would clearly draw "pizza," Ergo "quirky," and C-Belle "perverse." 1. Fear. When I first saw this word, I was afraid that Jay thinks I am ruled by fear. I was afraid that I talk too much about my fears, or that I am in fact ruled by them. All joking aside, this word knocked me for a loop. Once I recovered, I realized that I have been living with pretty steady fear for seven years. In March of 2002 M.'s heart condition was diagnosed. In July of 2005 R.'s diabetes came to light. And since August of last year I have lived with fear as a constant companion, to one chest-clutching degree or another. It makes me think of two things: 1) Anne Lamott said that after she had her son her loose belly lay on the bed next to her, "like a puppy" 2) In "Falsettos" Whizzer sings of Death that he's "a funny pal with a weird sort of talent. He puts his arms around my neck and walks me to the bed. He pins me up against the wall and kisses me like crazy." We have these undesirable companions in life that we learn to live with. I'm not fond of Fear, but if he ever goes away he'll leave a space in my life that I may have to work to fill. 2. Faith is a gift that was given to me by two people (in addition to God): my grandmother and my husband. Grammie taught me my Sunday school songs and Bible stories, made me say my prayers at bedtime and modeled an uncomplicated and unshaken belief in God. In college R. showed me that Catholic Intellectual was not an oxymoron, as I had previously been led to believe. After we were married, I got to know many wonderful men and women who helped me to understand the nature of the Eucharist, which of course is what brought me to the Church; but they also introduced me to my personal favorite thing about Catholicism, which is the Blessed Mother. Mary and the feminine principle are shunted aside like something embarrassing in most Protestant theology (which is one of many reasons the disingenuous blather of The Da Vinci Code is so infuriating), but in my faith she has pride of place. I love having her to hear my prayers. I have a "cradle Catholic" friend who told me she has trouble with this--"It's like, why would you talk to the nurse when you could go to the doctor?" --and it made me wonder if she has ever met a doctor, or perhaps I should be going to her doctor...but that's another post. 3. Family. My parents taught me that family is everything, and it is. 4. Voice. This my favorite. I have a new job, a tiny little job doing voice overs for business-to-business podcasts. It's a very satisfying use of two God-given gifts (a pleasant-sounding voice and the ability to read ahead a little) and a few learned skills (breath control, modulation, expression); it only takes a few minutes at a time and I can do it whenever my parents are available to watch the baby, which is almost always. Perhaps the best thing about this job, though, is that it caused my mother to have a revelation: "I was telling P___ [her hairdresser] that this voiceover job is an outgrowth of the one thing you did in life without our input, the one thing that was not our idea, and we didn't really support: acting." She's half right, or a third right: it's a magical combination of acting, singing and reading. They are all about using my voice, or listening to someone else's. Because yes, I make very little distinction between oral voices and written ones. I have not given up on this whole published-writer thing. Before I bailed on the creative writing program at supersecret college (to which, let me marvel, I had applied and been accepted, but still felt unworthy to stick with. Sorry, a lot of prepositions there. ), my professor told us to write an Ars Poetica. Mine began, "My greatest fear? That I could lose my voice." My masters thesis? Song and birdsong as ars poetica in the poems of Emily Dickinson. "I love to talk, I nearly live to sing," that poem also said. 5. Water. My sister- and brother-in-law are going to Fiji next month, and I am not jealous. Why? Because, as M. so memorably said to a nice old lady last year in Barbados, "I like my ocean better." And my rivers, and my streams and creeks. Do I like where I live because it's close to the beach, or do I like the beach because it's close to where I live? Hard to say, because as with singing and writing, I have "home" and "water" mixed up. It was a wrench for me to go live in DC for four years after I got married, and yes I am aware of the Potomac. I like my rivers better. I wrote a poem about this too. It was perhaps the last poem I wrote, because I am not a genius and thus cannot write good poems when I'm happy. The gist of it was that I had to have the reception on the water, so I could show R. to the river as proof that he was worth going away for. Now I have both R. and water, and I can look at the intricate beauty of the river and submit to the awesome power of the sea. I know few better ways to bolster my faith. Almost fourteen years ago, when I was seven months pregnant with not-so-little-R., R. and I went to San Francisco for a job interview. The job wouldn't involve moving--R. was one of the earliest telecommuters we knew--but the company was there and we flew out for a sort of weekend-long vetting. Part of the weekend was spent at the company's retreat house near the Russian River. If I had multiple lives to live, one of them would be modeled on life at that house. It contained a looong refectory table, a multitude of twin beds, a multitude of rocking chairs, and very little else. There were two sheep and a hammock out in the yard, and by the kitchen door, a rosemary bush. For dinner we ate sausage that the butcher had made from the meat of a wild boar shot by our host, and it was seasoned with some of that fresh rosemary. I can't entertain rotating hordes of spiritually-minded guests and I suspect there are very few boar running around our nearest woods, but I thought I would like to have a rosemary bush by my back door. 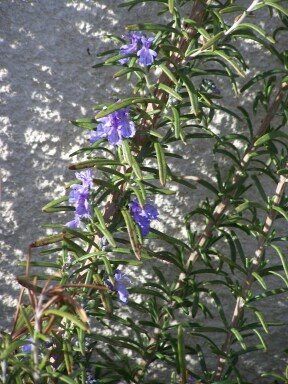 Let us draw a veil over the intervening years, in which I spent much money, time and heartache on rosemary plants of various sizes and varieties, which never over-wintered and sometimes died before they were planted. But now I have rosemary that has survived enough winters to achieve shrubbery status. It snuggles up against the back wall of the house, and scents the breeze by the patio. This spring, for the first time, it has blue flowers. Ophelia said rosemary was for remembrance, but this year I am taking it for hope.